Spartan Games is starting up a new volunteer program for their gaming systems: The Spartan Vanguards. Sign up and earn bonuses. How well do you know our games? Have you waged wars with different fleets in 1870? Did you supplement the power of your force in the Outer Reach with Escorts and Heavy Cruisers? Were your war vessels victorious in the Darnak Cluster? And do you enjoy showing others how to be victorius with our games? 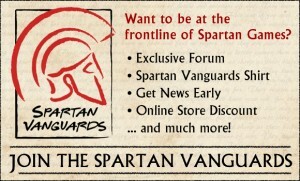 Then perhaps you have what it takes to join the Spartan Vanguards.